Hula Babe and Beach Boy put away their aloha duds and are once again the High Plains Drifters for a southwest road trip which will hopefully take us from winter into spring. We flew to Las Vegas and then set out for Scottsdale -- ultimately Tucson, Arizona, -- and then will head back to Las Vegas for our return flight. We got our rental car from a lobby kiosk at the Monte Carlo Resort, just a couple of blocks from The Jockey Club. 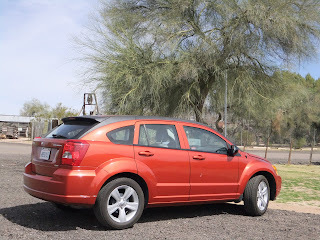 Money-saving tip #2: We had found the best car rental rate on Hotwire where the price was a couple hundred less for a Dollar Rent-a-Car than the cheapest we had found on our trusty Expedia. 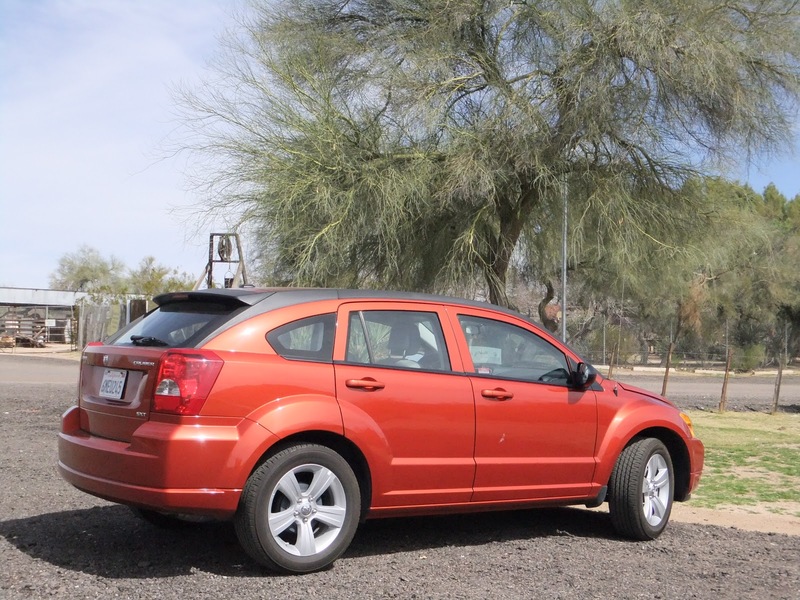 The car, a compact Dodge something, looks like, well, lets put it this way, think of an enormous orange rolling down the road. You got it; that's us. Joel: Can my wife be added as a second driver? (Enterprise had said spouses were added without charge in Hawaii). Prune: "Sure. $10 a day extra." Joel: How much grace period do we have on the return? (usually 15 minutes to a half hour). Prune: "One minute late - one day additional charge." Prune: "You must sign showing you declined coverage and that you are driving uninsured," pointing to the signature line. Joel pointed out we weren't uninsured, Prune pointed to the line all the same. Joel signed. Prune: "Did you fill the car with gas?" Prune: "I need to see the receipt." I reminded myself that we are saving a couple hundred dollars, reported the scratch to Prune, and we were off. Next post from The Timeshare Trail. But if you happen to see us drive up, stop by and say hello. and overeasy in Scottsdale is good breakfast food. enjoy the sun! And finally the sun has come out down here. Our first three days were overcast, windy and not very warm.